This article is about the film. For the eponymous character, see Gill-man. Creature from the Black Lagoon was filmed in 3D and originally projected by the polarized light method. The audience wore viewers with gray polarizing filters, similar to the viewers most commonly used today. Because the brief 1950s 3D film fad had peaked in mid-1953 and was fading fast in early 1954, many audiences actually saw the film "flat", in 2D. Typically, the film was shown in 3D in large downtown theaters and flat in smaller neighborhood theaters. In 1975 Creature from the Black Lagoon was re-released to theaters in the inferior red-and-blue-glasses anaglyph 3D format, which was also used for a 1980 home video release on Beta and VHS videocassettes. For marketing reasons, a comedic appearance with Abbott and Costello on an episode of The Colgate Comedy Hour aired prior to the film's release. The appearance is commonly known as Abbott and Costello Meet the Creature from the Black Lagoon. Ben Chapman reprised his role as the Gill-Man for the program. Creature from the Black Lagoon generated two sequels: Revenge of the Creature (1955), which was also filmed and released in 3D in hopes of reviving the format, and The Creature Walks Among Us (1956), filmed in 2D. The creature, also known as the Gill-man, is usually counted among the classic Universal Monsters. Autographed Julie Adams still featuring the Creature menacing Kay. A geology expedition in the Amazon uncovers fossilized evidence (a skeletal hand with webbed fingers) from the Devonian period that provides a direct link between land and sea animals. Expedition leader Dr. Carl Maia (Antonio Moreno) orders his two assistants to stay in camp while he visits the marine biology institute. Carl reunites with his friend and former student, ichthyologist Dr. David Reed (Richard Carlson). David works at an aquarium in California, but more recently he has been a guest at Carl's institute in Brazil to study lungfish. David persuades his boss, the financially minded Dr. Mark Williams (Richard Denning), to fund a return expedition to the Amazon to look for the remainder of the skeleton. Soon after Carl leaves camp, a piscine amphibious humanoid, a living member of the same species from which the fossil originated, becomes curious about the expedition's camp. When its sudden appearance frightens the assistants, they panic and attack, and in response the enraged creature kills them both. The group goes aboard the tramp steamer Rita, captained by crusty Lucas (Nestor Paiva). The expedition consists of David, Carl, Mark, as well as David's girlfriend and colleague, Kay Lawrence (Julie Adams), and another scientist, Dr. Edwin Thompson (Whit Bissell). When they arrive at the camp, they discover Carl's assistants have been killed while he was away. Lucas suggests it was likely done by a jaguar, but the others are unsure. A further excavation of the area where Carl found the fossil turns up nothing. Mark is ready to give up the search, but David suggests that perhaps thousands of years ago the part of the embankment containing the rest of the skeleton fell into the water and was washed downriver, broken up by the current. Carl says the tributary empties into a lagoon. Lucas calls it the "Black Lagoon", a paradise from which no one has ever returned. The scientists decide to risk it, unaware that the amphibious "Gill-man" that killed Carl's assistants has been watching them. Taking notice of the beautiful Kay, the creature follows the Rita all the way downriver to the Black Lagoon. Once the expedition arrives, David and Mark go diving to collect rock samples from the lagoon floor. After they return, Kay goes swimming and is stalked underwater by the Gill-man, who then gets briefly caught in one of the ship's drag lines. Although it escapes, the creature leaves a claw behind in the net, revealing its existence. Subsequent encounters with the Gill-man claim the lives of Lucas's crew members, before the creature is captured and locked in a cage aboard the Rita. It escapes during the night, attacking Edwin, who was guarding it. Kay smashes the creature with a lantern, driving it off, but Edwin is severely injured. Following this incident, David decides they should return to civilization. Mark, obsessed with capturing (or killing) the creature, objects. As the Rita tries to leave, they find the lagoon's entrance blocked by fallen logs, courtesy of the Gill-man. While the others attempt to remove the logs, Mark is mauled to death while trying to capture the creature single-handedly, underwater. It then abducts Kay and takes her to its cavern lair. David, Lucas and Carl give chase, and Kay is rescued. The creature is riddled with bullets before retreating to the lagoon, where its body sinks into the watery depths. Ricou Browning played the "Gill Man" in the underwater scenes of Creature from the Black Lagoon (1954), Revenge of the Creature (1955), and The Creature Walks Among Us (1956). Ginger Stanley did underwater stunts in the first two films. Producer William Alland was attending a 1941 dinner party during the filming of Citizen Kane (in which he played the reporter Thompson) when Mexican cinematographer Gabriel Figueroa told him about the myth of a race of half-fish, half-human creatures in the Amazon River. Alland wrote story notes titled "The Sea Monster" 10 years later. His inspiration was Beauty and the Beast. In December 1952, Maurice Zimm expanded this into a treatment, which Harry Essex and Arthur Ross rewrote as The Black Lagoon. Following the success of the 3D film House of Wax in 1953, Jack Arnold was hired to direct the film in the same format. The designer of the approved Gill-man was Disney animator Milicent Patrick, though her role was deliberately downplayed by make-up artist Bud Westmore, who for half a century would receive sole credit for the creature's conception. Jack Kevan, who worked on The Wizard of Oz (1939) and made prosthetics for amputees during World War II, created the bodysuit, while Chris Mueller Jr. sculpted the head. Ben Chapman portrayed the Gill-man for the majority of the scenes shot at Universal City, California. Many of the on-top of the water scenes were filmed at Rice Creek near Palatka, Florida. The costume made it impossible for Chapman to sit for the 14 hours of each day that he wore it, and it overheated easily, so he stayed in the back lot's lake, often requesting to be hosed down. He also could not see very well while wearing the headpiece, which caused him to scrape Julie Adams' head against the wall when carrying her in the grotto scenes. 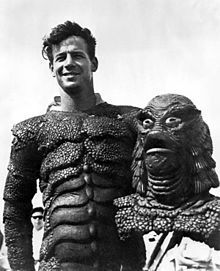 Ricou Browning played the Gill-Man in the underwater shots, which were filmed by the second unit in Wakulla Springs, Florida. In 1980, Universal released Creature from the Black Lagoon on video cassette in an anaglyph 3D version, using the Deep Vision anaglyph 3D release as its source. Subsequent releases on VHS, Beta and DVD were the 2D version. On October 2, 2012, Universal Studios Home Entertainment released the film on Blu-ray as a 2D / Blu-ray 3D dual format disc as part of the "Universal Classic Monsters: The Essential Collection" box set. On June 4, 2013, the Creature from the Black Lagoon Blu-ray disc was released as a stand-alone title. Creature from the Black Lagoon was novelized in 1954 by John Russell Fearn under the pseudonym of "Vargo Statten", then later, in 1977, in mass market paperback under the pseudonym of "Carl Dreadstone". This was part of a short-lived series of books based on the classic Universal horror films. The 1977 book was introduced by Ramsey Campbell, but was written by Walter Harris. The 1977 novel offers a completely different Gill-man, who in this version of the story is gigantic, almost as big as the Rita herself, weighing in at 30 tons. It is both coldblooded and warmblooded, is a hermaphrodite, and also possesses a long whip-like tail. The gigantic creature is dubbed "AA", for "Advanced Amphibian", by the expedition team members. After slaying most of the team members, destroying a Sikorsky helicopter, and kidnapping Kay more than once, the creature is killed by the crew of a United States Navy torpedo boat. The 1977 novel also differs greatly with respect to the human characters. Only David Reed and Kay Lawrence remain the same. Mark Williams is a German named "Bruno Gebhardt" and dies not as a result from drowning, but by the monster falling on him. Lucas is named "Jose Goncalves Fonseca de Souza" and is a mostly sympathetic character, until his suggestion of throwing the wounded and unconscious Reed to the monster makes an enraged Gebhardt/Williams throw him to the beast instead. Dr. Thompson and Dr. Maia both die grisly deaths, whereas in the movie they survive; Maia is eaten by the monster, and Thompson is impaled on a long tree branch flung at him by the creature like a spear (in an apparent nod to a deleted scene from Revenge of the Creature wherein the Gill-man killed a guard in this fashion). Creature from the Black Lagoon spawned two sequels: Revenge of the Creature (1955), which was also filmed and released in 3D in hopes of reviving the format, and The Creature Walks Among Us (1956), filmed in 2D. A comedic appearance with Abbott and Costello on an episode of The Colgate Comedy Hour aired prior to the film's release. The appearance is commonly known as Abbott and Costello Meet the Creature from the Black Lagoon. In 1982, John Landis wanted Jack Arnold to direct a remake of the film, and Nigel Kneale was commissioned to write the screenplay. Kneale completed the script, which involved a pair of creatures, one destructive and the other calm and sensitive, being persecuted by the United States Navy. A decision to make the film in 3D led to the remake being canceled by producers at Universal, both for budgetary concerns and to avoid a clash with Jaws 3-D. In 1992, John Carpenter was developing the remake at Universal. He originally hired Bill Phillips to write the script while Rick Baker was hired to create the 3D model of the Creature, but the project never got green-lit. Herschel Weingrod and Timothy Harris wrote a new script, and Universal offered Peter Jackson the director's position in 1995, but he chose to work on King Kong instead. In February 1996, Ivan Reitman was planning to direct the remake, but the outing never materialized. With the financial success of The Mummy remake in May 1999, development of the Creature from the Black Lagoon remake was revived. In December 2001, Gary Ross signed on to write and produce the remake with his father, Arthur A. Ross, one of the original's writers. He told The Hollywood Reporter, "The story my father wrote embodies the clash between primitive men and civilized men, and that obviously makes it a fertile area for re-examination." In August 2002, Guillermo del Toro, a fan of the original, was attached as director. He had hoped to do a story focused more on the Creature's perspective and letting him have romantic success, which he would later turn into the 2017 film The Shape of Water, but Universal heads rejected this concept. Because of these creative clashes and his commitments to numerous other projects, Universal was forced to go without del Toro and hired Tedi Sarafian (credited on Terminator 3: Rise of the Machines) to write a script in March 2003. In October 2005, Breck Eisner signed on as director. "As a kid, I remember loving Jack Arnold's original version of this film", he explained. "What I really want to do is update an iconic image from the '50s and bring in more of the sci-fi sensibility of Alien or John Carpenter's The Thing (1982)." Ross said in March 2007 the Gill-man's origin would be reinvented, with him being the result of a pharmaceutical corporation polluting the Amazon. "It's about the rainforest being exploited for profit", he said. However, the production was delayed by the 2007–2008 Writers Guild of America strike; as a result, Eisner made The Crazies (2010) the number one on his priority list instead. His new goal was to finish filming The Crazies and then begin filming Creature from the Black Lagoon in Manaus, Brazil and on the Amazon River in Peru. Eisner was inspired to shoot on location by the film Fitzcarraldo, and the boat set had been built. Eisner continued to rewrite the script, which was to be a summer blockbuster full of "action and excitement, but [still] scary". Eisner spent six months designing the new incarnation of the Gill-man with Mark McCreery (Jurassic Park, and Davy Jones' designer). The director said the design was "very faithful to the original, but updated" and that the Gill-man would still be sympathetic. In 2009, it was reported that Carl Erik Rinsch might direct a 2010 remake that would be produced by Marc Abraham, Eric Newman and Gary Ross; however, a project featuring this ensemble had been abandoned by 2011. 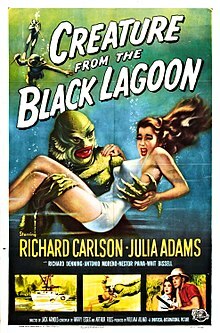 In March 2012, Universal announced that a remake was in production, and would simply be titled The Black Lagoon rather than Creature from the Black Lagoon, in order to distinguish the two versions. In October 2012, the studio hired Dave Kajganich to write the film. The film was expected to hit theaters by May 2014, but was ultimately cancelled. Universal Pictures is developing a shared universe of rebooted modern-day versions of their classic Universal Monsters, with various films in different stages of development. The series begins with The Mummy (2017) and will continue with Bride of Frankenstein (2019). The Creature from the Black Lagoon has a story written by Jeff Pinkner and a script written by Will Beall. In June 2017, Kurtzman revealed that the Gill-man will be from the Amazon. But on November 8, 2017, Alex Kurtzman and Chris Morgan moved on to other projects, leaving the future of the Dark Universe in doubt. On January 15, 2018, it was reported by Omega Underground that the production team for the Bride of Frankenstein has reassembled and are now eyeing Gal Gadot for the lead role. 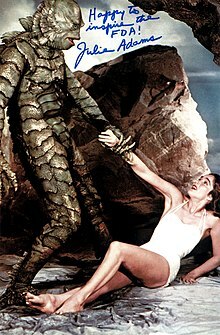 The 2017 film The Shape of Water was partly inspired by Guillermo del Toro's childhood memories of Creature from the Black Lagoon; he wished to see the Gill-man and the film's co-star Julie Adams succeed in their "romance". ^ a b Furmanek, Bob and Greg Kintz. "An in-depth look at 'Creature from the Black Lagoon'." 3dfilmarchive.com, 2012. Retrieved: November 19, 2013. ^ "Portrait of Ginger Stanley sitting on a diving board - Weeki Wachee Springs, Florida." State Archives of Florida. Retrieved: March 23, 2015. ^ a b Vieira 2003, pp. 141–143. ^ Ferrari 2003, p. 287. ^ Maltin, Leonard. Leonard Maltin's 2014 Movie Guide. Penguin Press. p. 298. ISBN 9780451418104. ^ "Creature from the Black Lagoon (1954) - Rotten Tomatoes". Rotten Tomatoes.com. Rotten Tomatoes. Retrieved 22 August 2016. ^ "AFI's 100 Years...100 Heroes & Villains Nominees" (PDF). Retrieved August 20, 2016. ^ a b Murray 2005, pp. 154–156. ^ Archerd, Army "Olympics to cross finish line in style." Variety, July 19, 1992. ^ a b Archerd, Army. "Hiller relieved that noms weren't leaked." Variety, February 12, 1996. ^ "Recreating the Eighth Wonder." King Kong (3-disc Deluxe Extended Edition DVD), 2006. ^ Fleming. Michael. "Kornberg reups at U." Variety, May 20, 1999. ^ Linder, Brian (December 13, 2001). "Back to the Black Lagoon". IGN. Retrieved January 22, 2018. ^ Linder, Brian (August 7, 2002). "Del Toro to Uni's Creature Redo". IGN. Archived from the original on October 19, 2008. Retrieved January 22, 2018. ^ "Del Toro Talks Black Lagoon Influence On "Shape" - Dark Horizons". darkhorizons.com. Retrieved November 20, 2017. ^ Linder, Brian (March 11, 2003). "T3 Scribe Penning Creature". IGN. Archived from the original on August 18, 2012. ^ Snyder, Gabriel. "U's 'Creature' meets maker." Variety, October 19, 2005. ^ Cieply, Michael. "On screens soon, abused Earth gets its revenge." The New York Times, March 12, 2007. ^ Rotten, Ryan. "Exclusive: Eisner on Creature from the Black Lagoon Remake." Shock Till You Drop, May 2, 2008. ^ Fleming, Mike (December 14, 2009). "Creature to Feature Rinsch?". Variety. Archived from the original on August 22, 2010. ^ "'Creature from the Black Lagoon' Taps New Director for Revival." bloody-disgusting.com. Retrieved: March 23, 2015. ^ Kit, Borys. "'Creature From the Black Lagoon' nabs a writer (Exclusive)." The Hollywood Reporter, October 12, 2012. Retrieved: March 23, 2015. ^ "Where The Creature From The Black Lagoon Monster Comes From In Universal's Dark Universe". Cinema Blend. June 6, 2017. ^ "Bill Condon's 'Bride of Frankenstein' Assembles A Production Team - When Will It Shoot? - Omega Underground". omegaunderground.com. Retrieved 2018-01-16. ^ "The Iconic Horror Movie Scene That Inspired 'The Shape of Water' – Bloody Disgusting". bloody-disgusting.com. Retrieved October 16, 2017. Ferrari, Andrea. Il Cinema Dei Mostri. Milan, Italy: Mondadori, 2003. ISBN 88-435-9915-1. Murray, Andy. Into the Unknown: The Fantastic Life of Nigel Kneale. Stockport, Cheshire, UK: Critical Vision, 2005. ISBN 1-900486-50-4. Vieira, Mark A. Hollywood Horror: From Gothic to Cosmic. New York: Harry N. Abrams, 2003. ISBN 0-8109-4535-5. Warren, Bill. Keep Watching the Skies: American Science Fiction Films of the Fifties, 21st Century Edition. Jefferson, North Carolina: McFarland & Company, 2009, (First edition 1982). ISBN 0-89950-032-3. Wikimedia Commons has media related to Creature from the Black Lagoon.